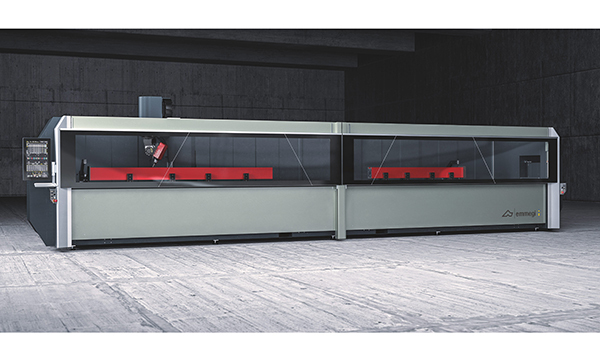 Safety, low sound levels, flexibility and ease of use are amongst the key benefits of the brand new fully enclosed Comet R6 machining centre from Emmegi. Seen for the first time at Fensterbau, the Comet R6 (HP) is a 5-axis machining centre with a 7.5m working range. The new guard enclosure, which comes as standard, optimises operator safety and reduces sound levels considerably. The Comet R6 can machine aluminium, PVC-U, light alloys or steel and has two modes of operation – single or double. 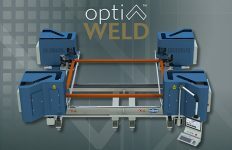 The real flexibility comes from the fact that users can machine single bars at the full working range or machine two separate bars simultaneously in two independent work areas. In double mode, two additional NC controlled axes even allow the vices and reference stops to be positioned while the machine is operating, without an axis reference cycle being required. 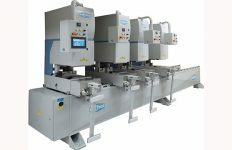 This not only minimises downtimes when loading and unloading bars but effectively creates two machines in one with the two different sides of the cantilevered machine working independently. A mobile work surface makes the loading/unloading operation easy and helps to increase the workable section. The high torque 8.5kW S1 electro spindle rotates from -15° to 90° on the horizontal axis and from 0° to 720° on the continuous vertical axis so that it can machine on all five sides of profile sections with very large overall dimensions. In terms of ease of use, the Comet R6 is the first of a new generation of machining centres from Emmegi which comes with a new 24in fully adjustable suspended monitor. The monitor is touch screen operated and swings vertically so that the operator can see it from wherever they are working. It has all the necessary USB connections for PC and remote interfaces and comes with keyboard, mouse and barcode and remote keyboard connections. 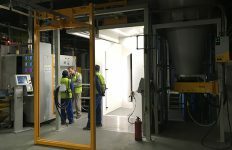 The machine has a 12-piece tool magazine as standard which is built into the lower part of the X-axis to speed up tool changeover times, and there is a sensor in the tool carrier to detect the correct cone position automatically. 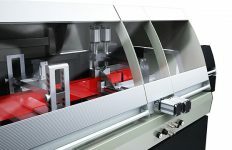 At Fensterbau, Emmegi showed the Comet R6 alongside an upgraded version of the popular Comet T4 4-axis machining centre – now branded the Comet X4. Like the R6, the X4 4-axis machining centre is now fully enclosed for safety and features the same 24in adjustable suspended monitor for the user interface. It has a 10-piece tool magazine with a provision to accept one angle machining head and a blade in order to machine on all 5 faces of the workpiece. With a 4m working range, it is ideal for fabricators who are producing lower volumes and also comes with a mobile work surface to increase the workable section.